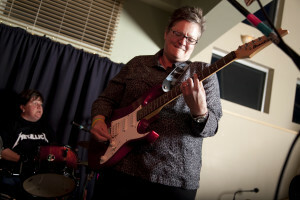 Ladies Rock Camp participant Maureen CassidyBut Cassidy did it successfully during a recent Ladies Rock Camp weekend. She describes it as life-changing, especially since she’d always had the dream of being a rock star. And Cassidy admits, even after becoming a mother and starting a career, she couldn’t shake the desire. “This is the way to live that out and be successful in rocking out. As an adult camper, you feel supported from the first hour. And with teachers like Kille, you really cannot fail in this endeavor,” says Cassidy who also tells of meeting women of all ages, including one camper in her early 70’s who learned to play drums as a member of one of the camp bands. But, Kille credits another woman as being the driving force behind the creation of the Madison camps. Halle Pollay’s daughter signed up for the Girls Rock Camp in Chicago, the closest location a half-dozen years ago. She landed on the waiting list, so Pollay decided to start a local version. And with Kille as the camp’s music director, the idea took off. “Our mission is to offer a culture of positive self-esteem and collaboration among the ladies or girls, while building community through music. I hope that through our camps, everyone feels empowered to go out and rock their dream, whatever it may be,” says Pollay.